On this page we have an interactive map of Garrucha which serves as a great visual guide for tourists and people intending to visit the small seaside town of Garrucha on the Costa Almeria coast of Spain. Whereabouts is Garrucha located in Spain? Which is the closest airport to Garrucha? Where can I find driving directions to Garrucha? Where can I find a free streetmap? The map above is a Google map which can be used in many different ways. At it’s simplest you can use it as a road and streetmap to find your way around the town. It will help you find your accommodation such as apartment or hotel and help with directions on how to get there from your point of origin (presumably Almeria airport or Murcia airport). The map can also be switched to a satellite view as in the Google Earth view. Now you will be able to see exactly what Garrucha looks like and especially the area in which you will be staying – very helpful! It is good to know if you are far from the beaches and centre of town where most of the best restaurants are located. Use the top left navigation buttons to you can zoom in or out and take a interactive virtual tour of Garrucha watching the panoramic images and pictures of the sights and attractions of Garrucha. Over time we will be adding more and more placeholders (markers) on the map to indicate popular tourist attractions and sights. In addition the best beaches, golf courses, tourist offices, markets, hotels, apartments, bars and restaurants within Garrucha will also be made obvious. Move left, right, up or down to see what is nearby to Garrucha if you have an interest in taking some days out in the Costa Almeria region, there is plenty to see and do such as the historic towns of Turre and Vera. Do note that Garrucha is a very small and charming tourist resort so don’t expect much nightlife or opportunities for shopping. For this we recommend a day trip to Mojacar (Mandala Beach is the best Mojacar nightclub) where you can also visit Pueblo Mojacar the old town perched up on the hillside. Despite this there are many things to do and see and places to visit and explore so it is best to hire a car in Garrucha. The map shows areas of interest such as the Puerto de Garrucha and Las Marinas de Vera. To the north of Garrucha you have Puerto del Ray, Vera Playa, Coto de Vera, Vera, Cabuzana, Rio Antas, Pueblo Salinas, Palomares, Cuevas del Almanzora, Desert Springs Golf Resort and Villaricos. To the south of Garrucha you have the Club Marina Golf Mojacar near the Urbanizacion Marina del Torre, Las Alparatas, Mojacar, Urbanizacion Canada Aguilar, Urbanizacion El Palmeral, Rio Aguas, Urbanizacion Vista Los Angeles, Turre, Los Gallardos, Urbanizacion Huerta Nueva and Antas. The harbour is the central point of the town because even today Garrucha is still a working fishing town and fishing accounts for a large part of Garrucha’s economy. 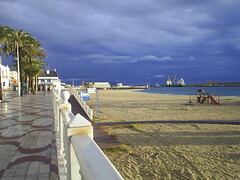 Garrucha is located between Vera and the much larger tourist resort of Mojacar. Page Summary – As well as our main tourist page, this map page is useful to locate the main points of interest in Garrucha. Now you will be able to get directions and know how to travel and get around, what to see and do in Garrucha. The map is ideal for going on some day-trips and excursions in the Almeria region.